Here at EpicOrange we can provide many different styles or wristband, our 4 most popular models are shown below. Silicon Wristbands with blind debossed logo or text. Child sizes are also available. 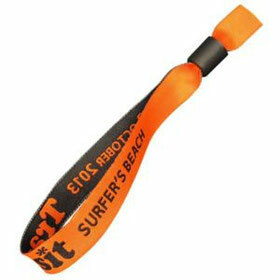 Silicon Wristbands Printed 1 to 4 solid spot colour logo or text. An economical form of visual identification. Made from anti-tear HDPE material. Adhesive tab enables fitting to all sizes. Printed 1 spot colour - full colour CMYK graphics. 15mm wide woven fabric wristband for festivals and events. 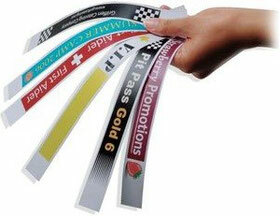 A sliding plastic sleeve with internal prongs prevents the wristband from being removed. Unlike bands with metal crimps, these bands do not need any tools to attach them. Printed 1-2 spot colours only.